How to Switch Off Credit Card & Debit Cards temporarily? Home » Credit Card » How to Switch Off Credit Card & Debit Cards temporarily? The misuse and illegal use of credit card and debit card is common story nowadays. Fraudsters love your money and they are always ready to get access by any means. If you are credit card or Debit Card user and worried about misuse of cards, this article is for you. In this post, I will share new feature introduce by ICICI Bank, SBI and Axis Bank to switch off credit card and debit card temporarily. It is a new enhanced security measure introduced by banks which give you complete control of your card. So if you are credit card or debit card user of ICICI, SBI or Axis Bank follow the step given below to Switch off and Switch On your cards as per requirement. How to Switch OFF/Switch ON SBI Debit Card? 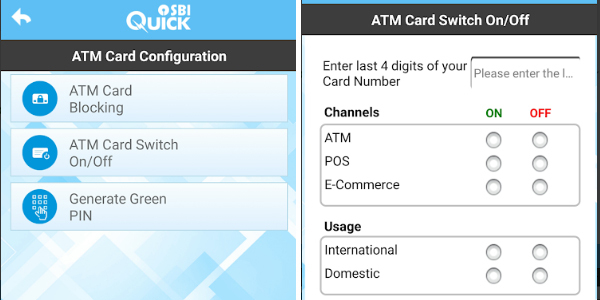 SBI offers mobile app namely “SBI Quick”. This app can be used to switch off and switch on your SBI Credit card and debit card. SBI Quick App is available on Android, Windows, iOS and Blackberry platforms. It is very easy to switch “off” or “on” your ATM debit card using this app. Follow the steps given below to perform the action. The first step is downloading SBI Quick App. You can download and install this app from Google Play. Once the app is downloaded go to ATM Card Configuration. On clicking ATM Card Configuration you will find three options (1) ATM Card Blocking (2) ATM Card Switch On/Off (3) Generate PIN. Click on ATM Card Switch ON/OFF option. Enter the last 4 digits of your card. Next is the selection of channels and usage. You can selectively disable your ATM for domestic and International usage. You can also define POS and E-commerce usage of ATM. If you don’t want to install an app for this purpose, you can use the alternative option of sending SMS for switching on and switching off your debit card. Type ‘SWON/SWOFFATM/POS/ECOM/INTL/DOM XXXX’ and send an SMS to 09223966666 from your registered mobile number. XXXX is the last four digits of your card. Also Read – Credit Card Statement – How to Read and Understand? How to Switch OFF/Switch ON ICICI Bank Credit Card & Debit Card? 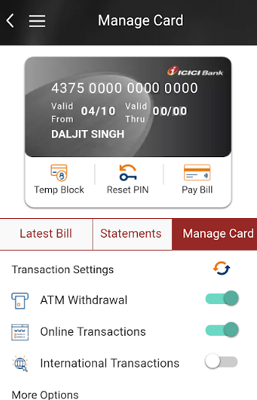 If you are ICICI Bank customer and holding ICICI debit card or credit card, you can manage these cards using iMobile app of ICICI Bank. iMobile app is available for Android as well on iOS platforms. You can temporarily block your card using this app. The step you need to follow for blocking ICICI card temporarily is given below. The first step is downloading iMobile App. You can download and install this app from Google Play. Once the app is installed go to Manage Card under Cards. You can also block the card temporarily using this app. You need to click on Temp Block for this. How to Switch OFF/Switch ON Axis Bank Card? Axis bank also provides facility to switch off the card if not in use. The name of the feature is “Total Control”. Total Control empowers debit card customer to self-manage and customizes card usage. This facility is available using Internet banking, Mobile banking, ATM and Phone banking IVR. Follow the step given below to use this facility. Also Read – Credit Card Limit Enhancement – Should You Opt? Download Axis Mobile App from Google Play Store. Go to manage your credit card transaction limit section. Here you can temporary block your credit card. You can even give request for the replacement of your card. You can also block usage of card for domestic and International purpose. I hope feature given above for self-controlling debit card and credit card will ease out your tension against fraud and misuse of card. Do you use above features? If yes, Don’t forget to share your experience in the comment section given below.